Even if it seems like all anyone talks about is San Francisco or Oakland, there’s a lot more to the Bay Area than our big-name cities. The dozens of towns that surround SF and the major East Bay hubs may technically be suburbs (or exurbs, or unincorporated townships), but each has its own unique, only-in-the-Bay qualities that are worth a trip out of the city. How to get there: While Golden Gate Transit runs buses from San Francisco, the easiest way to get to Mill Valley from Downtown SF is to drive 20 minutes north on Highway 101, and then head in from the freeway down Miller or Blithedale Avenues. What it’s got: Mill Valley is where Grateful Dead fans went to grow up, buy hillside homes, and retire. On the plus side: all those old hippies have excellent taste in food and shops. Eat the banh mi at Boo Koo and then get back to your '60s musical roots at Bob Weir’s Sweetwater Music Hall. Along with the cute Downtown, centered around a historic Gravity Train, Mill Valley is home to the start of the famous Dipsea Trail stairs and countless Mt. Tam trailheads. Pro tip: On Tuesday nights, the weekly comedy show at Throckmorton Theatre features local big shots like Dana Carvey (Robin Williams used to make surprise appearances), as well as hot up-and-comers. How to get there: Take BART’s Pittsburg-Bay Point line straight to the Downtown Walnut Creek stop, or drive east for 30 minutes along scenic Highway 24. 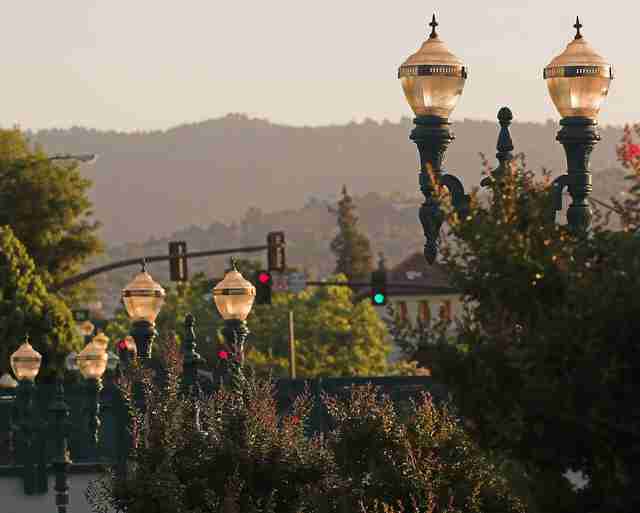 What it’s got: Walnut Creek is central Contra Costa County's most booming city, with a huge Downtown and access to all the open space you could want. From the BART station, head down North Main Street to the shopping district at Broadway Plaza, then follow up a hard day of spending with drinks on Locust St. The Lesher Center for the Arts holds musical and theatrical performances throughout the year, and an outdoor ice skating rink pops up every winter. Situated in a valley, beautiful hiking, biking, and views are just a car ride away at Mt. Diablo or Briones Regional Park. Pro tip: Mt. Diablo State Park is the giant behemoth looming over the town. The Summit Trail will take you all the way to the top of its 3,848ft, while the Grand Loop Trail circumnavigates the peak. Then head down the mountain to the Calicraft Brewing Company to rehydrate. How to get there: This lengthy but easy ride can end at one of two BART stations along the Dublin-Pleasanton line. Plus, at the intersection of Interstates 580 and 680, it’s a direct drive from SF and most parts of the East Bay. What it’s got: Rated one of the best places to live by both Money and USA Today, Pleasanton is over the hills and into the warm weather of the east East Bay. That means lots of warm nights, celebrated with a year-round farmers market and a bustling Downtown. In the summer, enjoy the First Wednesday events along Main St or concerts out at the popular Wente Vineyards (which also has a restaurant). 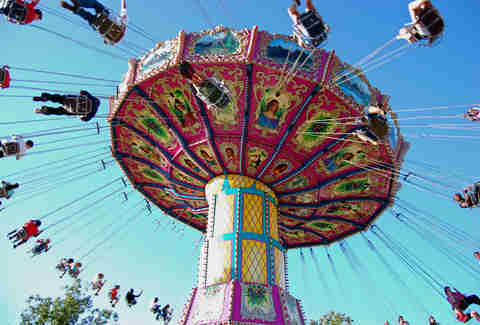 Yet, this haven is still part of the busy Alameda County and hosts the county fair at its fairgrounds in July as well as festivals throughout the year. You can also golf at one of the dozens of courses or hike the massive nearby Del Valle Regional Park. Pro tip: Take a swim at Lake Del Valle, then cruise Tesla Rd in Livermore’s wine country for a taste of the deep East Bay. How to get there: You have lots of options to get to the center of the South Bay. Take Caltrain to San Jose Diridon Station, hop on BART and then a VTA bus to the heart of Downtown at Santa Clara and First Streets, or drive right to where Interstates 280 and Route 87 meet. What it’s got: San Jose isn’t really a suburb; it’s actually the Bay Area’s biggest city with its own small neighborhoods (we’re looking at you, Willow Glen and South San Jose). Inside that booming metropolis is a Downtown that’s becoming known as a great place for dinner, drinks, and a night out. 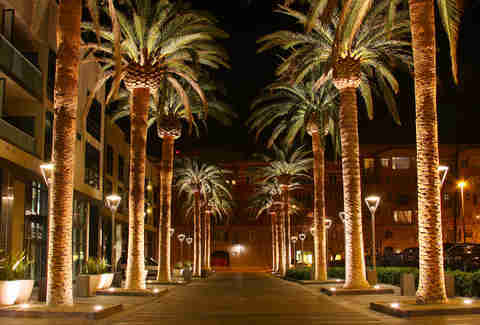 Walk down First St or Santa Clara Ave to find more restaurants and bars than you could visit. Before you get too full, visit one of the many museums in Downtown, like the fascinating Tech Museum of Innovation, or get tickets to any of the handful of theater companies filling up the neighborhood. If that’s too much culture for you, the San Jose Sharks play nearby. Pro tip: Take the train down to catch a show at City Lights, the historic California Theatre, or the large San Jose Center for the Performing Arts. Grab dinner first at The Grill on the Alley and have a post-dinner a drink at The Fountainhead. Unlike other ‘burbs, you’ll be able to walk everywhere. How to get there: Golden Gate Transit regularly runs direct buses between SF and Petaluma, along Highway 101. Beginning this fall, the SMART train will also stop in Petaluma. Alternatively, drive north for 45 minutes and take in stunning views. What it’s got: In the last few years, Petaluma made an effort to develop what it calls the Theater District along its riverfront, which is now filled with art galleries, restaurants, tasting rooms, and, yes, theaters. Head to the edge of the district to visit the Petaluma Historical Museum, or leave the city for the farms and wineries of Sonoma County. With so many local dairies, wineries, and breweries, eating, and drinking is key to any trip to Petaluma. Pro tip: Check out the Petaluma Creamery for local cheeses and award-winning lavender or Meyer lemon ice cream, then head to the famous and widely loved Lagunitas Brewing Company for a tour and a craft beer. How to get there: Take Caltrain to the Redwood City Station in Downtown or drive south from San Francisco on Highway 101 to the Peninsula. What it’s got: Redwood City is known as the home to tech giants like Oracle and as a popular home base for those working in San Francisco. But just to its east is the largest undeveloped island in the Bay Area: Bair Island. As part of the Don Edwards National Wildlife Refuge, the island has top-notch birdwatching and hiking. You can also rent a kayak or try rowing at the Bair Island Aquatic Center. 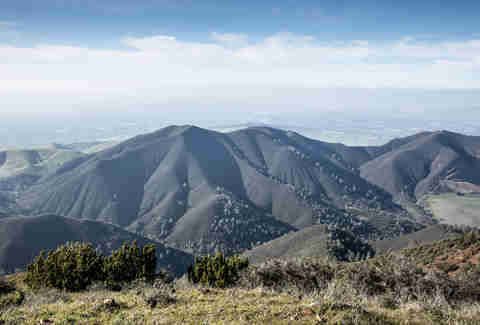 West of Downtown, which offers small bistros and bars, is an endless amount of mountains, state parks, and open space. 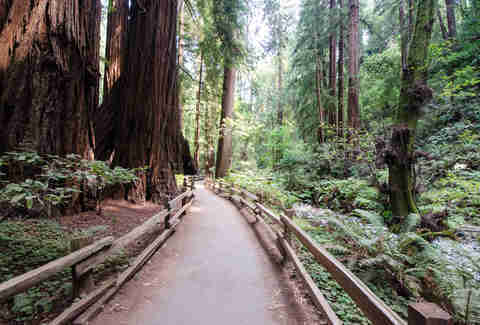 Locals hike at Phleger Estate or go for a weekend jog around Crystal Springs Reservoir. There’s even the rare Bay Area ice rink, Nazareth Ice Oasis. Pro tip: On Sundays, Canada Rd is closed to cars between Edgewood Rd and the Filoli Mansion entrance, making this stretch a great place to be for cyclists, rollerbladers, and runners. Take a break to check out the Filioli mansion and gardens. 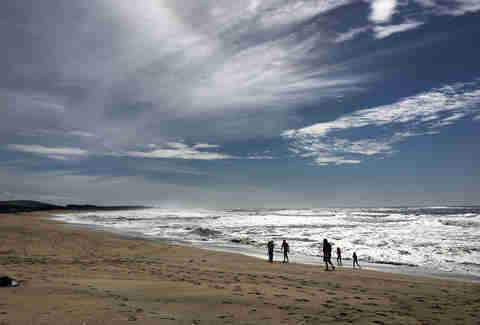 How to get there: The bus ride is too long for most, so snag a ride 30 minutes south down Highway 1 along the coast. 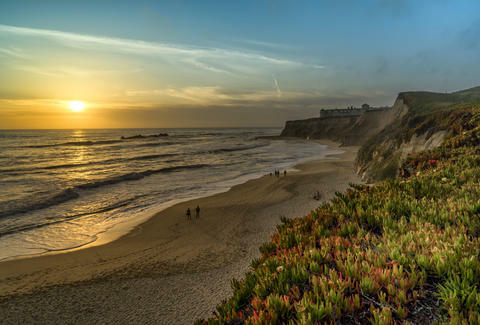 What it’s got: A coastal seaside town south of San Francisco (and named for the bay it surrounds), Half Moon Bay is most known for its beaches and the famous Mavericks surf contest. The number of state parks and protected marine spaces nearby seem to go on forever, including the Half Moon Bay State Beach, Pillar Point, and Montara Marine Reserve. If you wander in off the beach, the actual town of Half Moon Bay is full of historic buildings and, just to the south, the ghost town of Purissima. In the fall, when it gets a little cold for surfing and beach lounging, Half Moon Bay becomes home to one of the biggest pumpkin festivals around and some of the biggest pumpkins anywhere (last year’s heaviest pumpkin weighed in at 1,969lbs). Pro tip: If you’re looking to splurge, there’s a reason the Ritz-Carlton in Half Moon Bay has been used in movies, such as American Wedding. Walk out the back door along the cliffside, then curl up next to the hotel’s fire pits and admire the view. How to get there: About 40 minutes from San Francisco, drive south on Interstate 880, get off at Alvarado-Niles Rd, and head east for about six miles. If you take BART to Union City, then take an AC Transit bus down Alvarado-Niles Rd, which turns into Niles Blvd. What it’s got: Within the city limits of Fremont, the neighborhood of Niles is its own little community, complete with a community park, school, railroad, and busy Downtown area. Niles Blvd (also known as Main St) is home to antique stores and vintage car shows and a lot -- we mean a lot -- of historic silent film memorabilia. 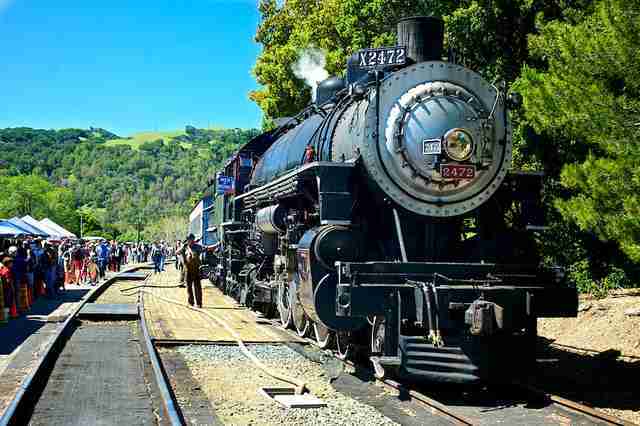 The Niles Canyon Railway leaves from the Depot right there in town, which you can catch after visiting local favorites like Devout Coffee and Niles Ice Cream. Pro tip: Once considered the first Hollywood and the location of a Charlie Chaplin production company, Niles celebrates his legacy with an annual festival -- and a lot of reverence. Visit the Niles Essanay Silent Film Museum and watch one of his films. How to get there: Locals are known to take down signs pointing the way, so use GPS to get to this unincorporated coastal town. 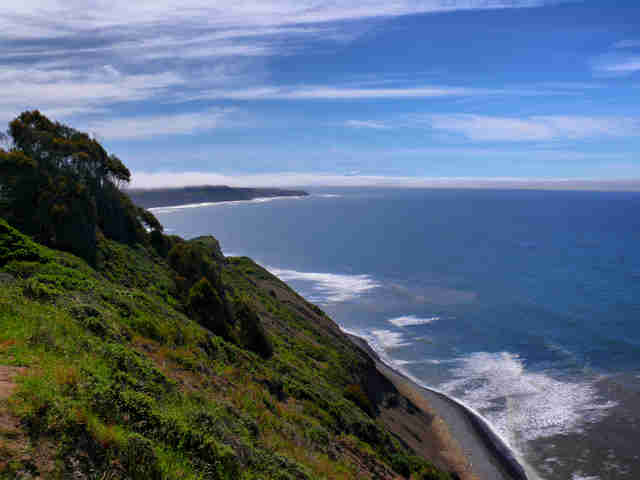 From San Francisco, drive north on Highway 1 for 45 minutes, then turn left on Olema-Bolinas Rd. The only public transit option is a infrequent West Marin Stagecoach. What it’s got: Bolinas has a reputation for not exactly welcoming outsiders, but once you get through the crusty exterior you’ll find a quaint little hippie arty beach town tucked in between Mt. Tamalpais State Park and Pt. Reyes National Seashore. There are just a handful of stores, a saloon that claims to be the oldest west of the Mississippi, and a very expensive gas station. The Pacific here is known to be friendly for beginner surfers, while Bolinas Lagoon is a calm and popular spot for kayaking and seal spotting. The town holds an annual tug-of-war competition on Fourth of July with neighboring Stinson Beach. Pro tip: Stop at 2 Mile Surf Shop for rentals and get out on the Pacific. Parking can be tough (and locals aren’t always happy to help), so look for a spot on Brighton Ave, then walk down to the beach and head left at the sand for more seclusion. How to get there: Plan to make a day of this trip, which will run you a little over an hour from SF. Head north on Highway 101, then take Highway 37, turn left at the Sonoma Raceway onto Highway 121 (which briefly turns into Highway 12). A left on Highway 29 then takes you past the town of Napa to Yountville. What it’s got: This is Napa County after all, so what you’re really here for is the wine and Yountville delivers. 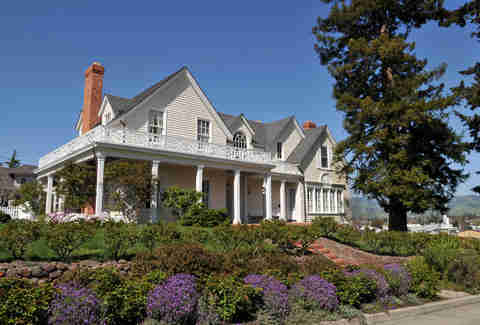 Use it as a home base for a wine-tasting tour down Silverado Trail and Highway 29. Napa has also become a culinary destination and Yountville is home to the world-famous The French Laundry (and the only slightly less-well-known Redd and Ad Hoc). If all those high-end spas and hotels get boring, take a hot air balloon ride or ride the miles of cycling routes up out of the valley. 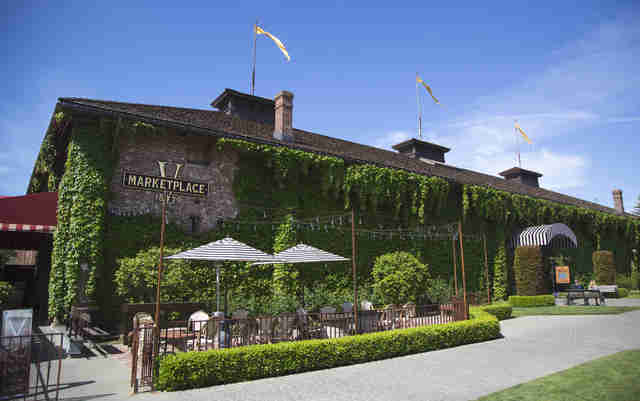 Pro tip: Yountville can be expensive. Visit during the off-season or on a weekday to get all the luxury without all the price tag. How to get there: Located on the Russian River along Route 101, downtown Healdsburg is an hour and fifteen minute drive north from San Francisco. Eventually, the SMART train will carry visitors straight to the town. 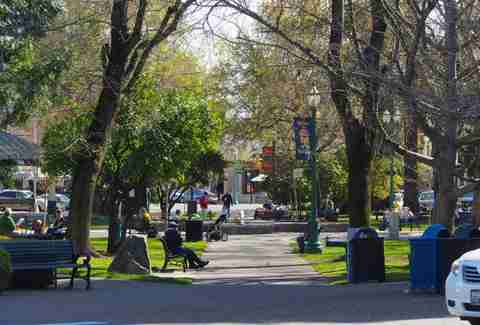 What it’s got: Healdsburg has won numerous distinctions as one of the top small towns in the country. Sonoma County might not be as famous a wine destination as Napa, but the wine is just as good. Additionally, Healdsburg is at the heart of a few different wine-producing regions -- the Russian River, Dry Creek, and Alexander Valley. Plus, with so much fresh produce growing on nearby farms, the local restaurants and markets are top-quality. Try local favorite, Scopa, and be sure to visit during the annual harvest, arts, and jazz festivals. Pro tip: The Healdsburg farmers market is considered one of the best. Held on Wednesdays and Saturdays, it’s not about frills, but it is all about local food mostly from farms within 10 miles of town.